December 11, 2018, 11:16 a.m.
A new YouGov survey shows that the Greens are Britain’s most well-regarded political party, with 41% of Brits holding a favourable view. In second place of the nine parties included in the study comes Labour, at 37%, with the Tories in third on 35%. Just under three in ten people (28%) say they like the Lib Dems, and 20% have a favourable opinion of UKIP. The Green party is also the only party with a positive net favourability score, meaning that more people like them than dislike them. As it is, just 37% of people say they dislike the Greens, giving the party a net favourability score of +4. By contrast, 51% of people dislike Labour, giving them a net favourability score of -14, while 54% dislike the Conservatives, giving them a net score of -19. The Liberal Democrats are also disliked by 51% of Brits (net score of -23). UKIP is the party that the highest proportion of people say they dislike, at 65%, giving them a net favourability score of -45. They are not the party with the worst net favourability score, however. That position goes to the Northern Irish republican party Sinn Fein, at -58 (62% have an unfavourable view of the party, while only 4% think positively). Although it should be noted that this survey was taken by British adults only, and so does not reflect opinion in Northern Ireland. British politics seems to be more partisan than ever; are any of the parties able to garner significant support from fans of other groups, or has partisanship put a hard limit on how well-liked parties can be? The results show large levels of cross-party support on the Left. 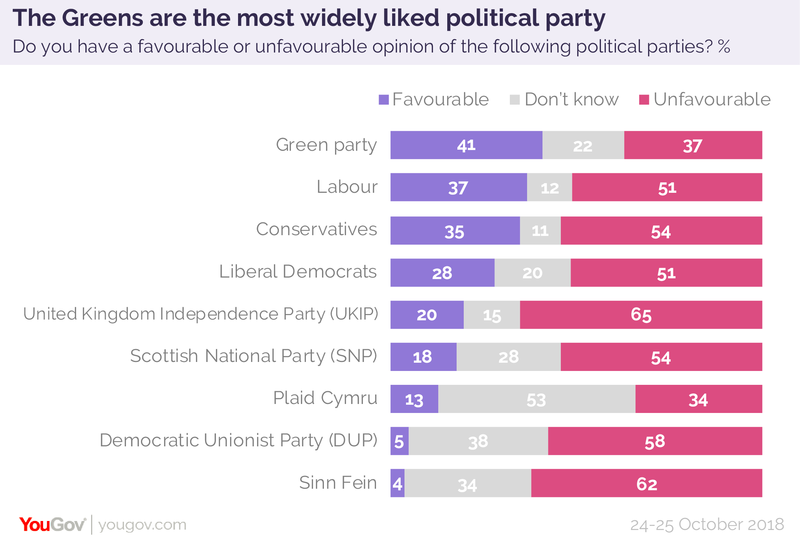 The Greens are wildly popular with people who like other left wing parties – receiving net favourability scores of between +48 and +58 among those with favourable views of Labour, the Lib Dems, Plaid Cymru and the SNP. The Labour party is also popular among those who like other left wing parties, scoring net values from +12 (among those who like the Lib Dems) to +40 (among those who like the SNP). The Lib Dems are less popular – while they are more liked by those who support the SNP (+12) and Greens (+7), they have a neutral net favourability score among fans of Plaid Cymru and a negative score of -3 among those who like Labour. There is strong mutual support between fans of the nationalist parties. Among those who like the SNP, Plaid Cymru receives a net favourability score of +32. Similarly, those who like the Welsh nationalists give their Scottish counterparts a score of +28. The big difference between the two parties is that Plaid maintains a narrow net positive score among fans of other parties left-wing parties (+2 to +5), while the SNP is somewhat disliked on the rest of the left (with net favourability scores of -3 to -11). Relations on the right are somewhat more one-sided. Those who like UKIP hold the Conservatives in high esteem, with a +28 favourability score. 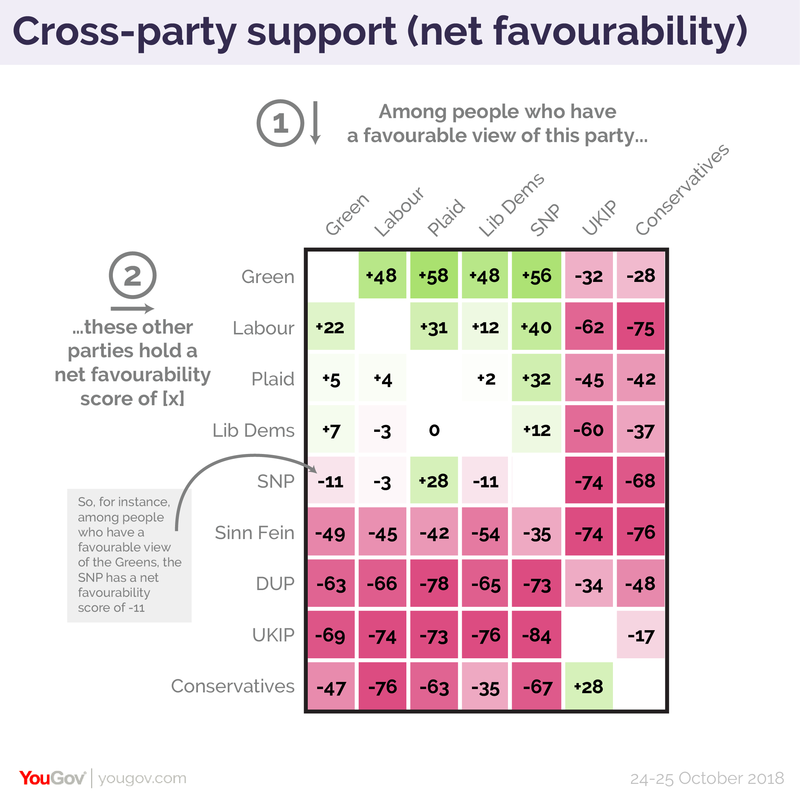 By contrast, those who like the Tories tend to view the smaller right wing party with disdain, giving UKIP a -17 net favourability score among this group.